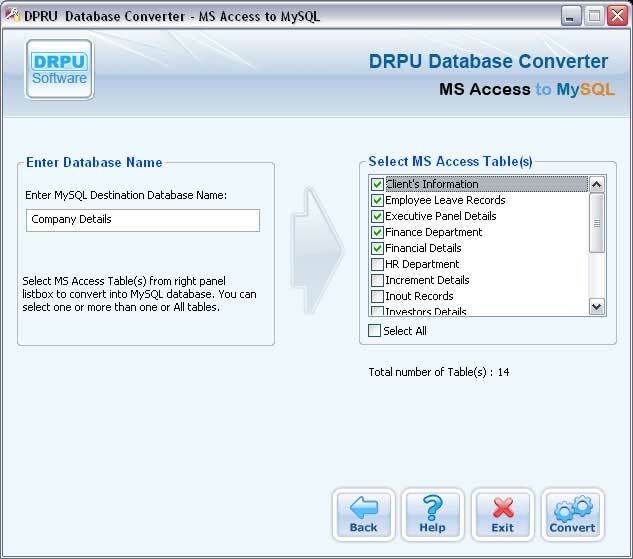 MS Access to MySQL database converter software systematically converts database records of MS Access to MySQL database server. Migration tool provides database table’s records conversion from MS Access to MySQL server even when Microsoft database file is password protected. Database files recovery software allows users to converts individual database table or entire database records of MS Access to MySQL server. Support default value, null value, entities, attributes and key constraints like primary key, unique key etc. Support all data types and attributes of MS Access database. Provide conversion of indexes and primary keys with all necessary attributes. Work with all versions of MS Access database server. Software provides user friendly GUI interface and maintains integrity of database. Full install/uninstall supports on windows VISTA, XP, 2000, 2003, 98, ME and NT operating system.